This is your new CEO: He’s exciting. He gets people fired up when he speaks. And he hasn’t yet met your consumer base. Unfortunately, these are traits that you can’t easily convey in a standard press release or social media announcement. If you want to get people talking about your new leader—or any other major announcement—you need to go the extra mile. This is why companies like Apple and Google hold yearly events for making announcements that attract massive audiences. Here’s one suggestion: Make your next announcement over a webcast. A Webcast, after all, works like a live, Web-based television feed. 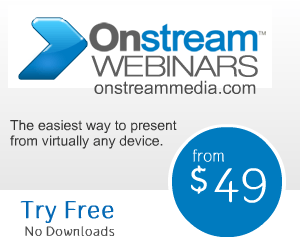 By using a solution like Onstream, your business can broadcast to anyone in the world who has an Internet connection. The solution doesn’t require any installation or setup, as it’s browser-based. Guests simply have to register for the event, and tune in and they will have a front row seat to the presentation. In the event of a major corporate announcement like a new CEO, your business can use a variety of media assets to enhance the presentation. You can show customers video, pictures, graphics and more. What’s more, Onstream makes it easy to engage with attendees both during and after the event through comprehensive question and answer sessions and live polls. Then, after the event, you can follow up directly with customers to provide further information and answer any additional questions they may have. So if you’re looking to transform the way that your company releases information to its customers, click here to learn more about how Onstream can help.